One of the most striking occurrences for me in Luke’s Passion is early on at the Last Supper, when Jesus speaks to Peter telling him that the devil had demanded to sift Peter like wheat but that Jesus had prayed for Peter’s faith. Peter quickly responds that he will never falter in his faith, in fact that he is prepared to go to prison for the Lord and to even die for him. Yet, in that same moment, Jesus tells Peter that he will deny him three times. Later that evening, the Lord’s prophecy comes to pass, just as he is being mocked by the Temple guards who tell Jesus to prophesy. 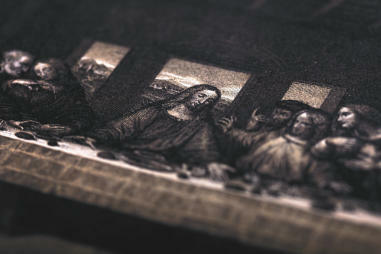 When Peter denies Jesus, Luke tells us that Peter catches the Lord glancing through the crowd at him in that moment. What a moment; in fact the thought of that scene always gives me chills. After that moment, realizing what has happened, Peter goes out and weeps bitterly for his betrayal. I have often thought about that glance of Christ towards Peter. What did it look like? I can imagine it being mixed with heart-break and pain but also with love and mercy; in no way do I imagine that glance being one of condemnation. So, what about in our lives, in those moments when we fail the Lord through our sinfulness and human weakness? How is the Lord looking at us? I imagine its quite the same. A look of pain but also one that invites us back, to know again the love that the Lord always has for us. His glance is one that does not illicit fear but that invites us to the fullness of mercy. The Passion narratives of Matthew, Mark, and Luke rotate on a three-year cycle for Palm Sunday and this year the Church is presented with Luke’s narrative. Throughout Ordinary Time this year we have been presented with Gospel selections from Luke and that will continue after Pentecost but this Lucan year also continues in the upcoming Easter season as Acts of the Apostles is traditionally understood as being authored by Luke too. Luke’s Gospel is divided into four parts: in the garden, before the Sanhedrin, before Pilate and Herod, and finally Jesus’s crucifixion, death and burial. While Mark and Matthew present us with a Jesus surrounded by darkness and impending doom, and John portrays a triumphant Christ, Luke offers us a gentle and merciful healer who has given himself over to the Father’s will and continues his mission to the end. Just as the Lord’s prophecy of Peter’s denial came to pass so did his prayer that Peter would not fail because Peter ultimately turns back to him. Peter humbles himself in contrition and therefore is able to receive the grace and the strength that the Lord wanted him to have. Sinners though we are, the Lord Jesus continues to intercede for us as he did for Peter. Mindful of our sinfulness in these sacred days of Holy Week, and always, let us turn to the Lord with humble and contrite hearts that we might know the fullness of his mercy, the power of his grace, and ultimately share in his victory as St. Peter did. 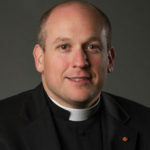 Father Christopher House is the Rector of the Cathedral and serves in various roles within the diocesan curia, namely Chancellor and Vicar Judicial.